A few days ago the Guardian newspaper offered up its advice on how to make the perfect egg fried rice. Glad to see it didn’t differ to much from our own here at ETP Towers – other than the non-addition of garlic. I think at the moment I’d also revise our version and go with the paper’s, although it’s a matter of personal taste. The newspaper’s recipe is here. X-ref with our own here. I’ve mentioned previously that many of the dishes we post in the ‘Last Night’s Dinner’ section of this blog are the interesting ones – the ones that make use of gorgeous seasonal ingredients, or that make a pretty picture on the plate, or are worked up to some extent: a weekend meal rather than a Tuesday-night supper. But that’s only half true. Our cooking at ETP towers varies little from weekday to weekend, mainly because at the moment yours truly doesn’t quite work a standard Monday to Friday 9 to 5 week. It’s also because even after a busy day’s work we enjoy a little kitchen prep and cooking as a way to relax. Why completely give that up during the week if you can help it? That’s a privileged position, however, and there are times of course when you don’t want to think about cooking; when easy fall-backs become a practical necessity. For some people that’s once a week, for others almost every evening. At these times we often resort to one-pot cooking to create a big bowl of health – for example our own signature dishes of butter beans, greens and peppers in a spicy tomato sauce, or spicy ‘Spanish’ chickpeas (recipes we may reveal in the fullness of time). This is basic stuff: take a big pot, fry an onion, add in some veg, chuck in some tomatoes, add spices, top with water and leave to simmer down. A hob-cooked stew, by any other name. You hardly have to think about making these and they’re so difficult to ruin. I’ve heard that many carnivores resort to Spaghetti Bolognese and stir fries for a quick weekday meal. Well, we don’t eat much pasta here, but a stir fry, such as the one pictured, does hit the mark. The beauty is that we don’t have to think too much about how to cook the ingredients. Simple innit? But is a good stir fry as basic as one-pot cooking? Well, it can be: if you use straight-to-wok noodles and throw all the veg in at the same time. Typically, however, and without wishing to turn a simple stir fry into a culinary challenge, I do now think a little extra effort can help. 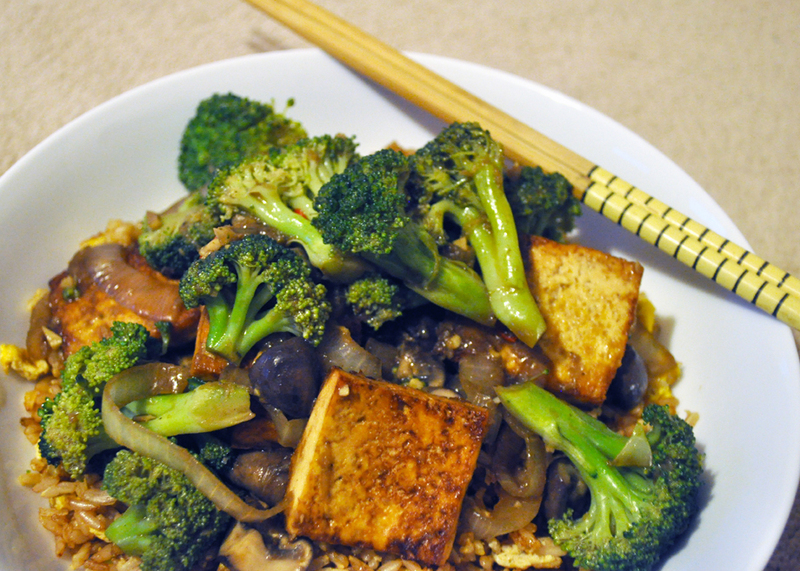 Take the tofu in our Stir-fried tofu with broccoli, mushrooms and rice (above). 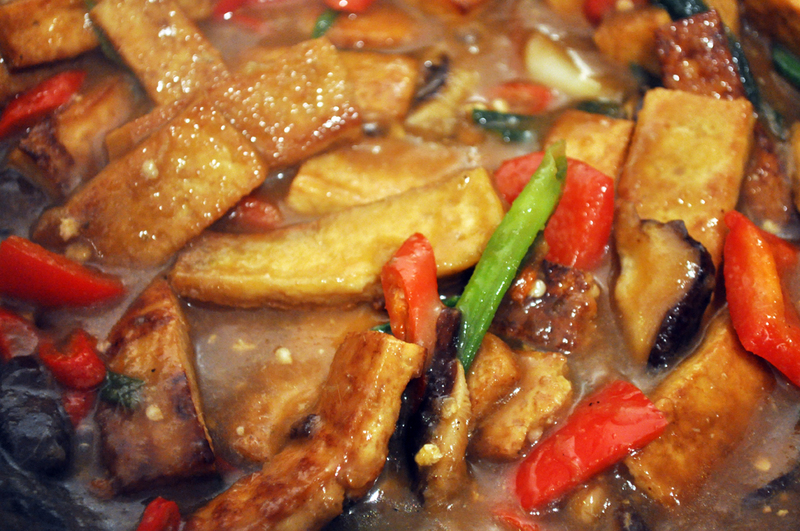 Throwing chunks of even a firm tofu straight into the wok with the other veg will cause it to break up into a mush. Much better to fry it separately first for 5 minutes each side, then add it to the wok at the last minute. And the broccoli? To avoid tough stems it’s much better to steam it for 5 minutes before it hits the wok, too. So that’s two extra pans, but not a lot of extra thought. And it really does mean your stir fry will be a much more enjoyable Tuesday-night supper. On first glance I thought this recipe, here, for brown rice, courgettes and mint had two things going against it. First, as you might have realised, I don’t always trust Nigel Slater’s cooking. Amongst other things, I often feel he misses a trick and rejects obvious ways to pep up his food in favour of his own nostalgia-filled peccadilloes. 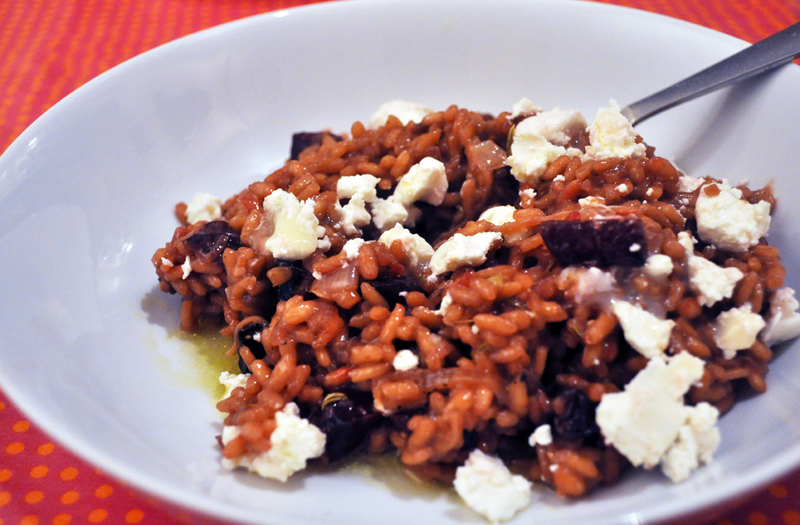 Second, I firmly believe anything you might want to call ‘risotto’ should be made with a proper risotto rice. So, this recipe fails twice before we’re even off. But… it looks rather nice. Nutty, summery, rustic, with a hint of old-skool veggie health food that suddenly looks almost vogueish. I think we’ll try it. In the East End of London, along Kingsland Road, you are spoilt for choice when it comes to Vietnamese food. There are so many cheap and cheerful restaurants from which to choose but our favourite is the Viet Hoa – it’s website is here. Ella’s regular choice is their rather fine tofu Bun Xa noodle dish, whereas I change what I eat there a litle more regularly. 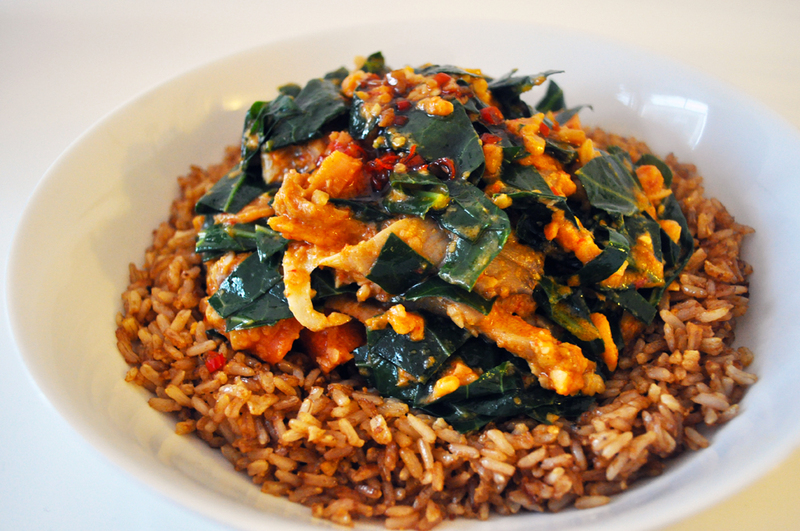 I like their fried rice – but you can probably tell by now that I’d eat fried rice nearly every day if I could. On our last visit the fried rice came with Tofu with lemongrass and chilli. A few weeks later I thought I’d see if we could replicate it and this a pretty decent attempt. Not sure of the authenticity, but it works. First, take a standard block of firm tofu, cut it into little-finger sized strips, no more than 1cm thick. Place them on a plate, sprinkle some dark soy sauce over them and set a side to marinate for 15 minutes. When the time’s up, fry off the tofu in a large frying pan with some sunflower oil until it is golden. Take care not to break the tofu strips. Set aside. Next, take two stalks of fresh lemongrass and chop them finely. Peel a 2cm piece of fresh ginger root, roughly chop 2 cloves of garlic and finely chop 2 small green chillis and 2 medium shallots. 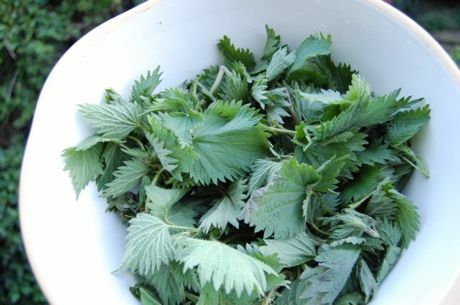 Put all these in a blender, add a splash of rice wine vinegar and blend until you have a paste. You may need to add a little water to help you on your way, and scrape down the sides of the blender part way through the process. Now roughly chop a red bell pepper into bite-sized pieces, slice six shiitake mushrooms, chop the ends off 6 spring onions then slice into thirds to create segments about 3cm long. Then slice up some fresh red chillis into rounds (as many as you like!). 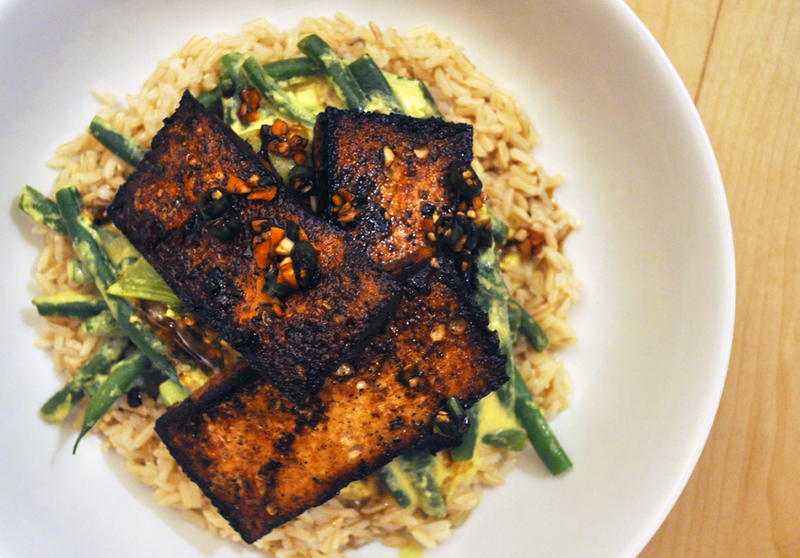 Heat some sunflower or groundnut oil in a wok and when it’s hot add the fried-off tofu. After a couple of minutes add the bell pepper, mushrooms, spring onions, red chillis and the lemongrass paste. Dry for around 5 minutes, stirring as you go. The pepper and onions should just start to soften a little. When that happens, mix 2tsp of cornflour and a little water in a small cup, stir well and pour into the wok. Add a few splashes of dark soy sauce (but not too much) and stir. After a minute or so this should create an almost translucent ‘sauce’ that will coat the tofu and veg. This ‘sauce’ shouldn’t be watery or overly sticky – it’s neither a gravy or a glaze. Somewhere inbetween is perfect.